UPDATED: She’d lost the confidence of a majority in Parliament and would have been held responsible for the collapse of Norway’s conservative coalition government. Justice Minister Sylvi Listhaug ultimately suffered the consequences of her controversial behaviour by announcing Tuesday morning that she would resign her cabinet post and instead take one of her Progress Party’s seats in Parliament. Her defiance, however, remained clearly intact. Listhaug’s surprise announcement came after a crisis meeting Monday night held at the residence of the Conservatives’ prime minister, Erna Solberg. Neither Progress Party leader and Finance Minister Siv Jensen nor Solberg herself had asked her to resign, she claimed, even though she faced a lack of confidence vote by a majority of the other parties in Parliament at 10am. That in turn could have toppled Solberg’s entire government. “It’s been completely up to myself to decide whether I would hold out or resign,” Listhaug wrote in yet another Facebook post that was published just after 8am, following a long live radio debate on her fate on NRK’s national radio program Politisk kvarter. “I’m glad that Siv and the entire party were willing to set their participation in government aside in order to support me as justice minister. But I cannot allow my departure to also cause the Progress Party to lose power and influence,” Listhaug wrote. Her decision to resign was quickly branded by political commentators as “completely correct” and “the best solution in this situation.” It was time, most agreed, for Listhaug to put her party and its government power ahead of her own self interests and demands for attention, even though her resignation may carry a high political price for all involved. At an 8:30am press conference held before Parliament was to open for the critical vote on her fate and the government’s, Listhaug appeared smiling, defiant, mocking and wearing her cross that also has stirred debate on occasion. She read aloud from the message she’d posted on her Facebook page and refused to accept defeat, repeatedly claiming tht she now would merely transfer her “battle” for restrictive immigration and integration policy and “western” ideals to the Parliament. 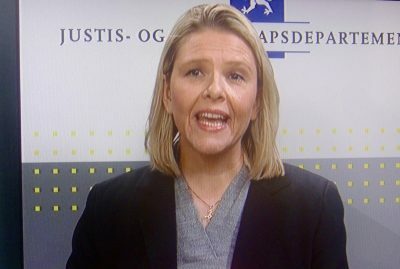 “The most important thing for me has been that it shall be the Progress Party that will steer Norwegian asylum and immigration policy for the next three-and-a-half years, and not (Labour leader Jonas Gahr) Støre, (Socialist Left leader Audun) Lysbakken and company,” Listhaug claimed. She described the past week, since she angered and outraged Labour and its survivors of the right-wing extremist’s terrorist attack on July 22, 2011, as “completely surreal.” She still claimed that her Facebook post 12 days ago, in which she accused Labour of putting the rights of terrorists above national security, “had nothing to do with July 22,” and she stressed that she had apologized for it. Her apology was not accepted. She went on to describe the fierce public debate as “turning Norwegian politics” and the Parliament itself into a barnehage (children’s day care center), and that it was thus up to her to act mature. That comment will likely also infuriate her opponents who claim that it’s Listhaug who regularly displays stubbornness and unprofessional language. Such statements, which she repeated often during the press conference, will likely be music to the ears of her right-wing, anti-immigration followers and indicate how she intends to continue to position herself in Norwegian politics. Many speculate she’s keen on replacing Siv Jensen as Progress Party leader and taking it into an even more radical direction, or perhaps founding a new anti-immigration party of her own. “Of course there are extremists out there, from whom I’ve time and again distanced myself,” Listhaug claimed on Facebook. She claimed that “completely normal people” had been “branded and hung out” in the coarsest of terms “simply because they supported me and the Progress Party’s battle for a strick and fair immigration policy.” She vowed that she won’t now head into Parliament quietly and will “concentrate 100 percent” on fronting the Progress Party’s policies, without the rstraints of being a member of government. Her tone and comments at her morning confernce were defiant and sarcastic, and she continued to ridicule her political opponents, claiming that Labour leader Støre was “unsuited to be prime minister” and that the Christian Democrats, who held the swing vote in Parliament to force her resignation, was a party “lacking backbone and control.” Asked to elaborate on her description of Parliament as a children’s day care center, she said it was because a Facebook post could be taken so seriously and that Members of Parliament would not accept her apology. She refused to answer all questions pertaining to when she made her decision to quit and whether she had informed either Prime Minister Solberg or her own party leader, Siv Jensen, about it before publishing it on Facebook. She now stands to stir up more trouble for Jensen in Parliament, especially if she takes on a martyr role. 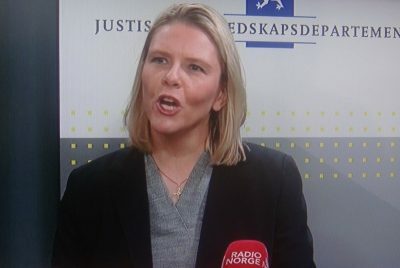 “She’s fashioning herself as the warrior who’s sacrificing herself for the nation, a sort of Joan of Arc,” political commentator Jon Arild Snoen told state broadcaster NRK after Listhaug’s press conference. Others commented that Listhaug’s resignation heads off the “acute crisis” when the government was faced with being toppled the lack of confidence vote in Parliament Tuesday morning, but cautioned that it can come at a high political price. 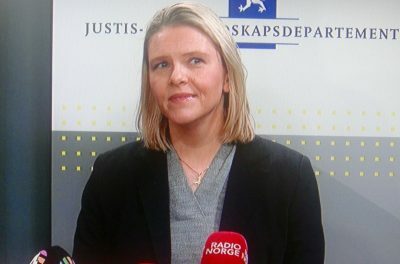 Listhaug wouldn’t answer questions about whether she’s learned anything from the reaction and turbulence of the past week, saying only that she simply has to be herself. That bodes plenty more turbulence in the future.